I know, I know, I have been absolutely awful with dong blog posts for the last week. It has been a crazily hectic week though and so much has happened so I really do have a valid excuse! Last week I was alone again for a lot of the week so I lived off Butternut Soup mostly and spent all my evenings in the gym to keep me busy and to keep trying to work off those stubborn post-Christmas pounds which seem like they have settled for good and are strongly resisting all my efforts to get rid of them. My only real culinary success last week was finishing my Tiramisu which is this month’s Daring Bakers Challenge. I can’t post pictures of it yet as it is not the ‘reveal date’ but I can say that it tasted absolutely yummy. To be honest it was not the prettiest Tiramisu that I have ever seen – I do need more practice in constructing them – but it did taste yummy. The Zabaglione/Pastry Cream/Whipped Cream combination was a smooth and creamy, not too sweet and not too rich, just right. I may attempt another one before the month is out to see if I can get the outcome any prettier and more worthy of being posted with all the other challenge results. One side effect of making Tiramisu is that you are left with a lot of egg whites. I ended up with about 5 of them in the fridge by the end of the weekend and not wanting them to go to waste, I proceeded to make meringues. 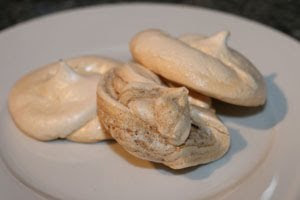 I haven’t made meringues in ages and they can be rather fickle things, sometimes turning out well and sometimes not so much. This batch turned out ok, and they are current;y in a tin in my kitchen awaiting their fate. I am pondering filling them with a chocolate ganache or something as plain old meringues can be a bit boring and a bit too much of a sugar hit without something to break it up. Now to hunt down a good ganache recipe, I have heard that the chocolate to cream proportions is an age-old debate and there are numerous variations on the mixture, so which one will be worthy when it comes to filling my little meringues?